Join the search for gold as you join the mining in the Yukon River with this online slot! This 5- reel – 3 row online video slot presents Klondike Gold Rush of the 19th Century. Like all their games by Play'n Go, this game has been developed with a generous use of HD graphics and is going to take you to the wild woods. There are beautiful glimpses of the wild jungles and river embankment in the background and the reels have been placed on the flowing Yukon river with shovels, axes and spades that are present in the form of the symbols used in this game. These coupled with the cracking sound of wood in the background are indeed going to take you back in time and make you feel like you are a part of the gold mining. But hey! Look out for those wooden chests as they may trigger bonus features like Rapid Respins, Gold Rush, River of Gold or the Super river of gold. Furthermore, they may themselves turn into golden chests and bring even more wins with the huge multipliers for you. 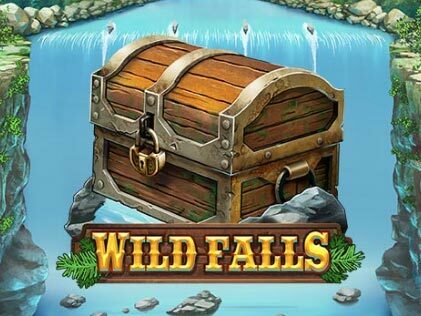 How to Play Wild Falls Slot? If you want to try out this latest online slot by Play n Go, all that you have to do is select the amount that you want to bet and spin the reels to let the fun begin. However, to be able to do this you will have to use some of the buttons that have been given below. Spin: It is the largest button that you will see at the bottom right hand-side of the reels and looks like a circle. Click on this button to enjoy the game play and spin the reels. Auto play: Located at the bottom extreme right-hand side, this button lets you spin the reels mechanically without having to click on the spin button again and again. Bet: This is the option you must use with utmost care as it lets you set the amount that you want to bet per line. Choose any value that you will see below the reels or set the amount according to your preference by using the “+” and “-” buttons available and either side of the bar displaying these values. All wins pay left to the right. Only the highest is paid per line. Wooden Chest symbols are the wild and the scatter symbols. Chests can stick to the reels for the respins. The reels of this game by Play'n Go are set on the stream of Yukon River. The transparent reels glide in front of the flowing water. Further unlike the other games, these reels have not been separated from the background by any frame or demarcation and the symbols appear to be floating on the water. The symbols that have been used consist of shovels, axes, wooden chests, pan and a bag full of coins and have been beautifully designed and bring out the theme of the game really well. Further, the low paying symbols which consist of playing cards have been textured to look like made up of stone and complement the theme of the game. All this is accompanied by the sound of cracking wood and the banjo track make this gameplay a treat to enjoy. The high paying symbols used in the game play include the objects associated with the mining of the gold hidden in the wild. These include wooden chests, shovels, axes, a bag full of coins and a pan with some coins on it. Although Play'n Go has used neutral colors like brown and grey in these symbols but they add to the appeal of the game because of being in sync with the theme of the game and the generous graphics that have been used making them appear almost real. Some alphanumeric symbols have also been used in the gameplay to give a more realistic look. These include symbols from the deck of the playing cards and include A, K, J, Q and the number 10. They have been given a grayish stone like texture which foes with the theme of the game very well. Wooden Chest: The wooden chests symbols acts as both the wild and the scatter symbol and appears only on the reel 2, 3 and 4. They activate Rapid Re-Spins, awards you multipliers and also trigger the Gold rush and the Super gold rush bonus round making it one of the symbols you would look forward to having on the reels each time they spin. Every time the wild chests appears on the reels, it brings for you 2x 3x or 5x multipliers. These wooden chests are sticky and trigger rapid respins in which they move down one row per spin. All the wooden chests turn golden in this bonus feature which is randomly triggered. These chests come with 2x, 3x and 5x multipliers that may combine to give up to 125 multipliers. Further, if you land 3 chests symbols in this round it may trigger the Super River of Gold free spins bonus round. When you land 3 wooden chests on the reels, it activates River of Gold. In this bonus round, the wooden chest sticks on the reels and move down one row at a time until no wooden chest is left on the reels. This feature is triggered only if you land 3 gold chests on the reels during the Gold Rush feature. The chests stay golden in this bonus round with 2x 3x or 5x multipliers for entire Free Spins round. The Free Spins will continue until there is no golden chest left on the reels thus bringing some massive wind for the players. This online slot game has been developed by Play'n Go which is known for its high-quality slot games. This software brand boats its collection of slot games that are some of the most enjoyable games for the players. It has been a part of the game industry for more than two decades now and has also emerged as a global brand. The high-quality work that it delivers has also been recognized at some platforms with the “ EGR Nordic Award for the best Casino Supplier 2017 and the Slot Provider of the Year 2017 IGA Awards being some of them. This slot game presents for the players one of the finest blend of interesting bonus features and high-quality graphics which is surely going to be welcomed by the players. The beautiful background which consists of the flowing river admist glimpses of wild jungles and the symbols like shovels, axes, golden chests and bag of gold that evoke the feel of gold rush are going to be a pleasant view for the players. Along with it, wooden chests that trigger some interesting bonus features like Rapid Respins, River of Gold and Super River of Gold are bound to bring abundance to wins to the players keeping them engrossed in the gameplay. 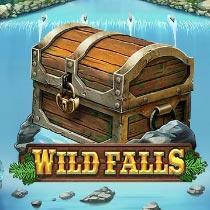 Please enter your review for the Wild Falls Slot .